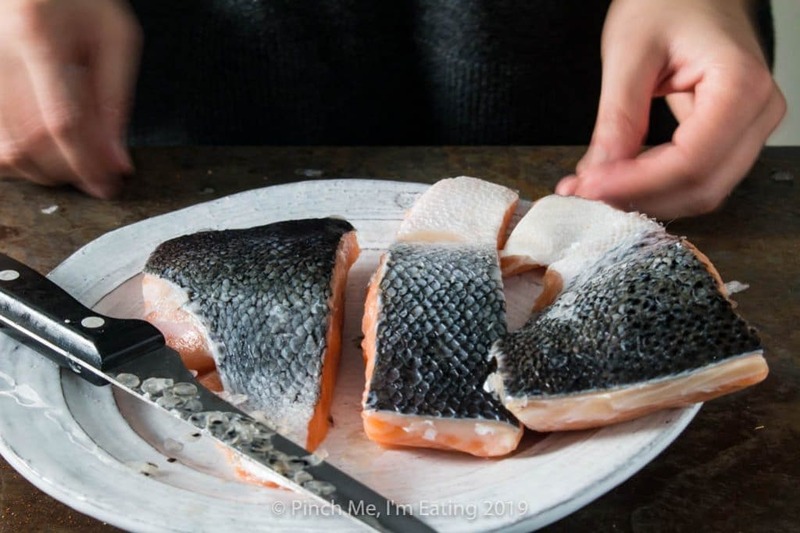 How to Descale Salmon Fillets | Pinch me, I'm eating! If you’ve never had a crispy-skinned salmon fillet, you’re truly missing out! 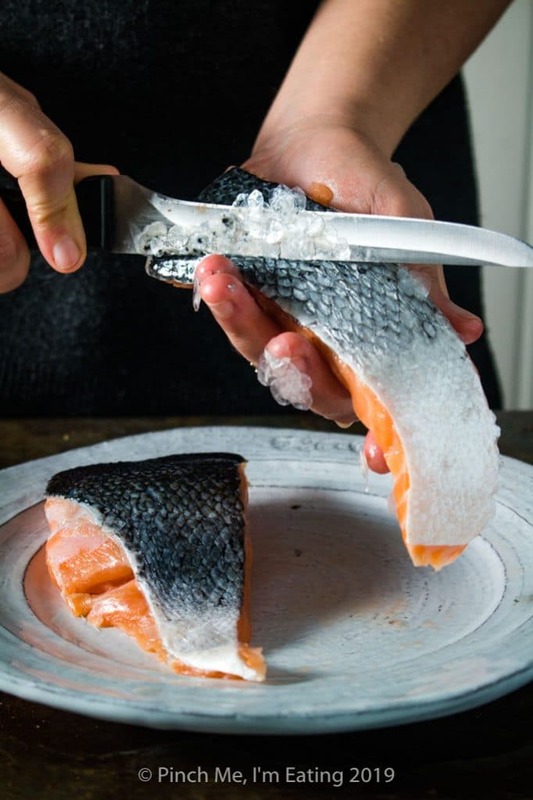 But don’t let scales get stuck in your teeth — learn how to descale salmon fillets in just a few minutes without any special tools! Salmon is one of my favorite foods in the whole world. 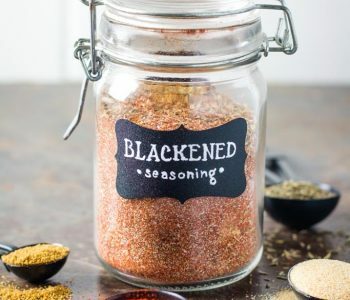 I like it just about any way it’s prepared — blackened, poached, baked, smoked, grilled, or raw. So we eat it probably once or twice a week and never get tired of it. For years I have defaulted to making it the same (albeit delicious) way almost every time — this foil packet salmon with soy and lemon. After it’s done baking, you just peel off the skin and enjoy. Easy peasy. However, I recently made pan-seared blackened salmon — with the skin on. And holy moly, was it life-changing! Not only was the flavor incredible, but the skin got so shatteringly crispy it was like a hybrid of salmon, a potato chip, and bacon. 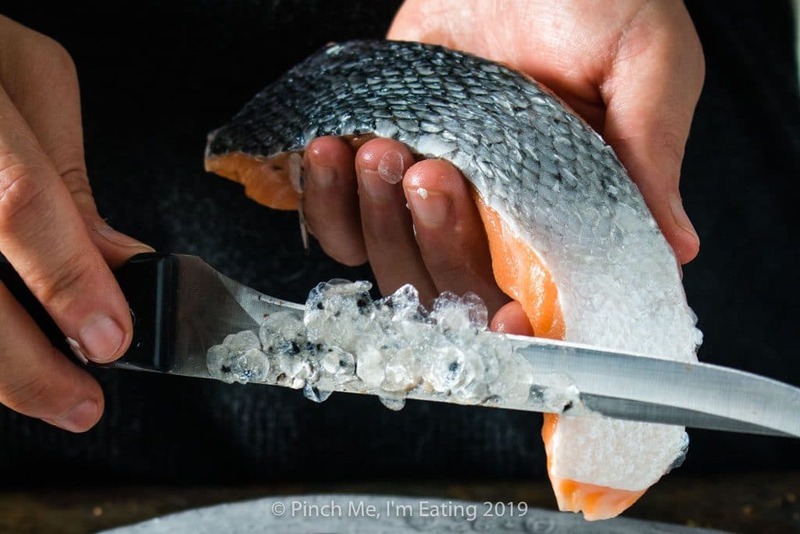 Salmon skin is so much better without a bunch of scales getting stuck in your teeth, so today I’m going to show you how to descale salmon fillets! 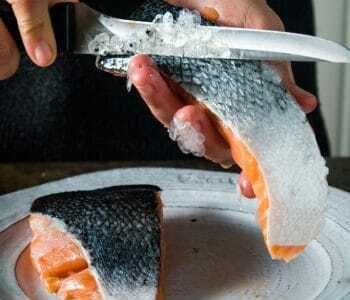 Do you have to remove the skin from salmon? 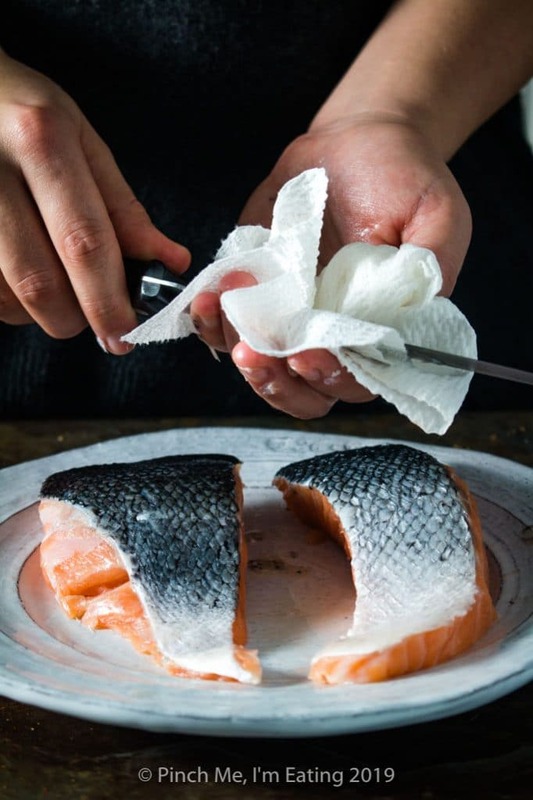 The question of whether to remove salmon skin is really up to you and your recipe. 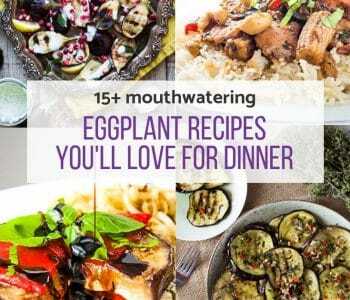 For steamed-type recipes like the foil packet one I mentioned, that’s totally the way to go. A soggy salmon skin is edible, but not particularly appealing. 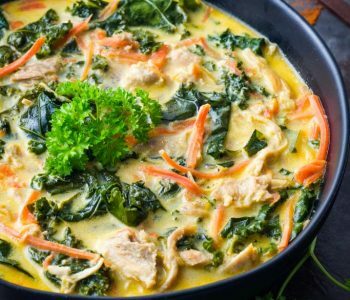 I don’t find it adds a lot to the dish, and it’s very easy to remove after the fish is cooked. Just peel it off! But for a recipe where the skin is in direct contact with heat and has the opportunity to crisp up? You won’t regret leaving it on! It’s the best part! 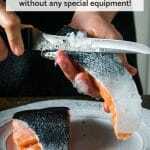 Do I have to remove the scales from salmon before eating it? Technically you can eat them but they’ll get stuck in your teeth and I imagine it’s not nearly as pleasant an eating experience as a nice, crispy, scale-less salmon skin. Does my salmon skin have scales on it? Turns out the amazing blackened salmon fillets I made the first time were already descaled — meaning, the scales were already removed when I bought the salmon. Yours might already be too! The brand I normally buy, however, is cut into nice little fillets, but still has all the scales on! (and yes, I buy frozen salmon – it’s usually fresher than the kind at the fresh counter, since salmon isn’t local to the Southeast). Usually I’ll find a couple loose scales on top of the fleshy side of the salmon but the others are pretty well-attached. 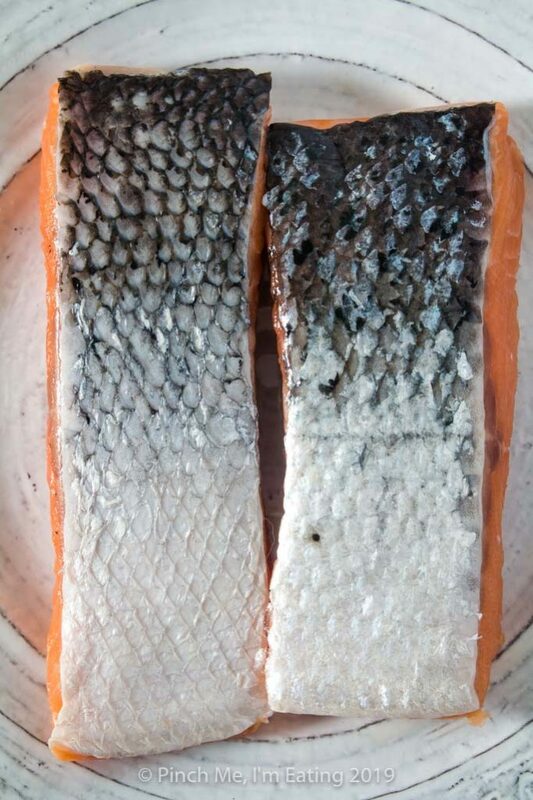 Here you can see the difference between a salmon fillet with the scales removed (left) and a salmon fillet with the scales still on (right). You can see all those shiny little overlapping bits like sequins in the fillet on the right (most noticeable at the top). 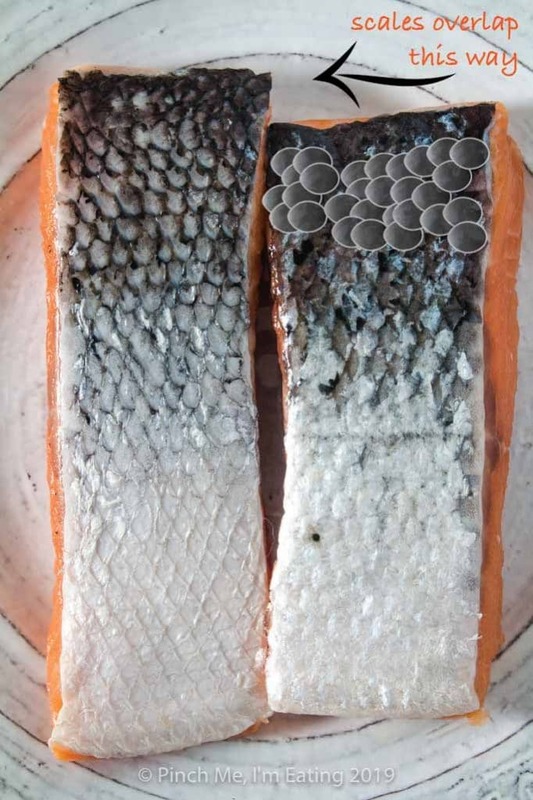 The fillet on the left has smooth, shiny skin, with almost a diamond-shaped pattern at the bottom graduating up a pattern of overlapping ovals. So how do I remove the scales? First, figure out the direction the scales are overlapping. With the fillet on the right, you can see the scales overlapping from right to left. One would think running your finger over the scales the “wrong way” (left to right on the fillet above) would be rough, but it’s actually very smooth both directions until you start catching the edges of the scales. Using a fingernail works better if you are having trouble figuring out which direction is the wrong way. Scraping your fingernail over the skin from left to right would “fluff up” the scales a bit, kind of like petting a cat the wrong direction. “Fluffing up” the scales is exactly what you want to do, but with a knife. And you want to fluff them up so much they come off. So just slide the blunt edge of the knife under the edges of the scales to help lift them up. Then I scrape (still in the opposite direction of the scales) using short strokes and the scales start coming right off! Here, I’ve held the salmon fillet so that I am scraping the blunt edge of the knife away from my body, from palm to fingertips. 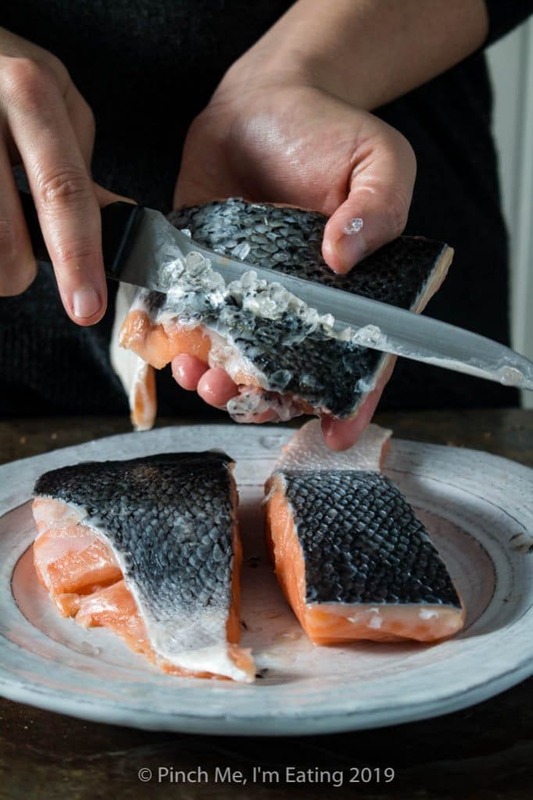 Doing this under a gentle stream of cool running water will help loosen the scales too, and keep them from sticking to your hands (and fingertips and shirt – seriously, salmon scales are like the glitter of the food world. They stick to EVERYTHING). Look at all those scales! 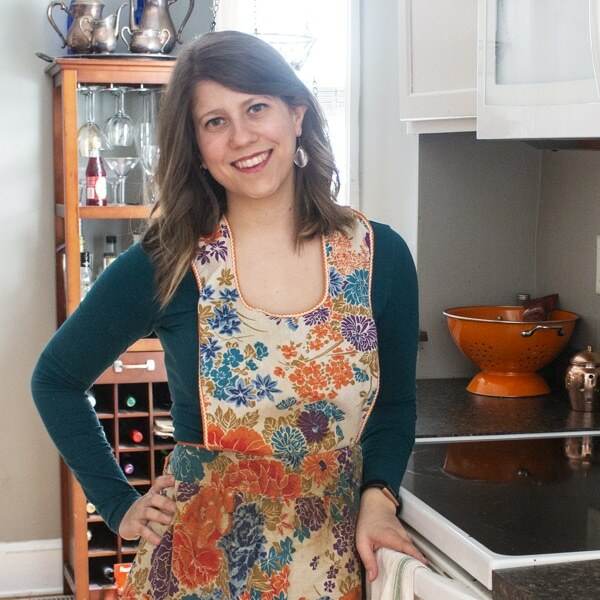 Keep a paper towel or dish towel handy to wipe the scales off on. Repeat, scraping with short strokes in the opposite direction of the scales, until they all come off. The edges are the most difficult, since you also want to keep the flesh intact. Just use a little extra caution around those bits. Then gently rinse your salmon under cool water to get rid of any scales still trying to stick to the fish (they’re clingy little buggers!) and voila! 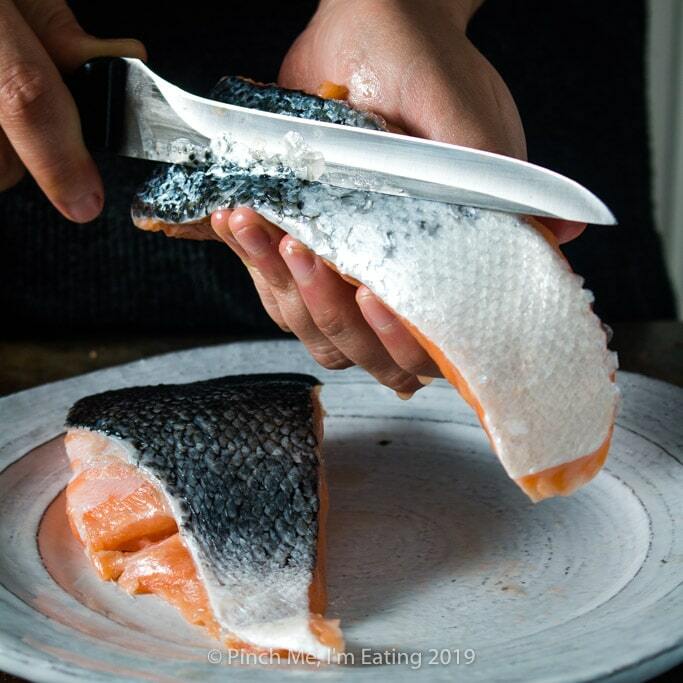 Smooth, beautiful, scaleless salmon skin — perfect for crisping up in a cast iron skillet! Be sure to pat your salmon dry afterward! Your salmon skin won’t get crispy if it’s wet, and that’s the whole point of this descaling thing anyway! 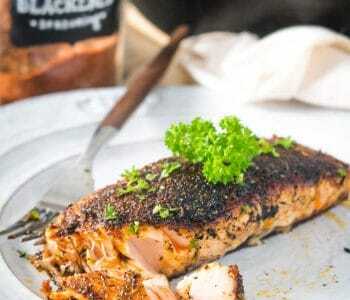 Check out my recipe for crispy-skinned blackened salmon so you can truly enjoy the fruits of your descaling efforts!